The 'Mustang' name and even the company's iconic Blue Oval that had been given as collateral on Ford's 2006 line of credit are now back under the automaker's control. NEW YORK (CNNMoney) -- Ford Motor Co. got its logo out of hock Tuesday after Moody's upgraded the automaker's credit rating to investment grade. The decision by Moody's to raise the credit rating means that Ford can now take back control of assets -- including the Blue Oval logo and trademarks like Mustang and F-150 -- that Ford (F, Fortune 500) put up as collateral in 2006 when it used virtually all its North American assets to open a $23.5 billion line of credit. "The Ford Blue Oval is back where it belongs with the Ford family of 166,000 employees around the world," said Ford Motor Co. Chairman Bill Ford. "This is a great day for us and is the result of several years of hard work and progress by everyone associated with Ford," he said. 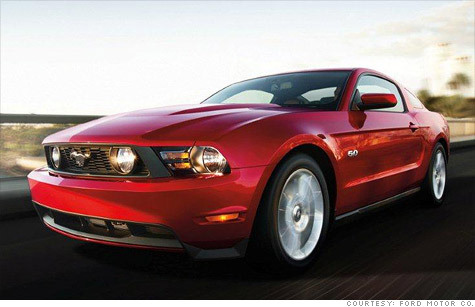 The 2006 line of credit helped Ford avoid the sort of bankruptcies faced by competitors General Motors and Chrysler. But by avoiding bankruptcy Ford didn't get the advantage of walking away from much of its debt, the way GM (GM, Fortune 500) and Chrysler Group were able to do during their reorganizations. But Ford has made progress shaving down its debt. And now, with the rating increase, it should be easier for it to refinance at lower interest rates. Ford had $16.6 billion in automotive debt still on its balance sheet at the end of the first quarter, but several years of strong profits also gave its auto unit $23 billion in cash, giving it a positive cash position. "The key factor in our considering an investment-grade rating for Ford was whether or not the company would be able to sustain its strong performance. We concluded that the improvements Ford has made are likely to be lasting," said Bruce Clark, senior vice president with Moody's, in a statement. Ford's stock was one of the most active stocks in after-hours trading jumping about 1.4% to $10.33 a share. Ford shares ended the day Tuesday at $10.19 a share. Ford shares are down 5.3% so far this year. Losses in Europe and Asia have dragged down results.